Manali is a town located on the high hills of Himachal. It is a hilltop full of villages with scenic surroundings, hippie culture and adventurous avenues. The town is located on Kullu valley along the National Highway that leads to Leh. 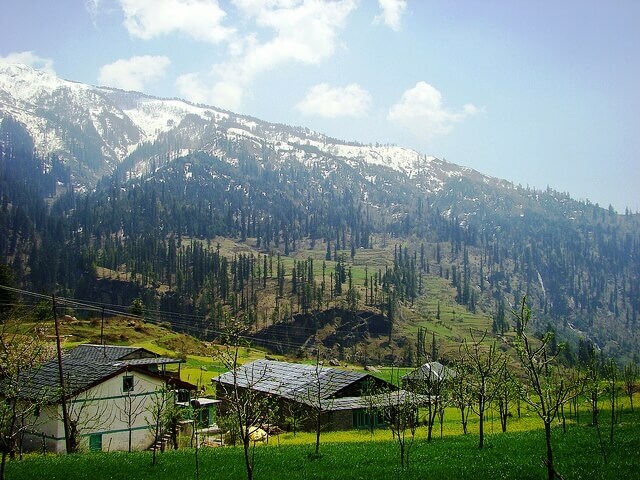 Manali is found along the snowline and with towering peaks a distance away. Manali is commonly referred to as the Switzerland of India or Mini Switzerland. It is an ideal destination for honeymoon lovers, a known tourist destination and a developing orchard industry. It is also a good and preferable summer vacation destination for families as well. It is a base for trekkers going to Zanskar, Leh, Kinnaur and Spiti. Also the Motorcyclist across the globe who comes for Himalayan Motorbike Expedition prefer it to begin their journey. Lots bike rental options are available at Manali. Riders can hire motorcycles for their journey to Ladakh and Spiti. The town of Manali is flooded with Hotels, Resorts and Restaurants. The place is also a sacred pilgrimage for the Hindus. They are hot springs containing sulfur. They are considered sacred and known for rejuvenating and medicinal use. You can choose to take a warm bath in the spring. It is found about 2 km from downtown Manali. The sanctuary was first notified in 1954, and houses a variety of Himalayan fauna and flora with some species of animals such as the ibex, snow leopard and lion. This present day wooded temple is home to the goddess known as Hidimba Devi, who was the wife of Lord Bhīma of Mahabharata. It was built by Maharaja Bahadur in the year 1553. It is a four storied temple known for its local deities, plants and animals. Found inside the temple is a small statue of goddess Hadimba which is made of brass. This is among the famous attractions in Manali. The winter carnival takes place annually and lasts for five days. It occurs in the month of January when Manali sleeps beneath thick blankets of snow. The festival commences at the Hidimba Devi temple through worship of the goddess Hadimba. Cultural events, winter and cultural sports also take place during this festival. The carnival attracts many tourists from all over the globe. Some of the woolen items include paper silk printed and embroidered saris, salwar suits with Kashmir embroidered border and kullu shawls and caps. Another popular shopping spot is the Tibet market famous for Tibet art collections and handicrafts which is famous with visitors. Tribal jewellery and wooden items are also a famous attraction here. Apples are used to make pickles which is a must have in Manali. Green apples common at the end of July are used for preparing pickles that will make your mouth water. Lingad, which is a wild asparagus is a local vegetable which is quite famous too. The pickles have a taste similar to that of French beans commonly found in the plains. Vegetarians can have a taste of trout commonly found near the mall road in Manali. It is found in the freshwater’s of river Beas as well as its tributaries. This fish is rich in omega-three fatty acids that minimizes the risk of cardiovascular ailments, cholesterol and stroke. Also Weather of Manali makes it the prime summer vacation spot for tourist. Manali is highly promoted by Himachal Tourism.